The Madrid edition of InteriHotel closed its doors with very good reception: in the course of two days, 886 visitors – hospitality professionals and prescribers from the contract-hospitality sector – were able to discover the novelties presented by the 50 exhibiting brands, suppliers of interior equipment for hotels. InteriHotel celebrated its first edition in the capital of Spain on June 20th and 21st. The event ended with a very significant participation of professionals: 886 architects, interior designers and hotel professionals attended to see first-hand the latest trends in interior design for hotels. With this edition, InteriHotel reaffirms itself as a business-generating event: a total of 465 of the registered professionals attended as part of a forthcoming reform or new hotel construction. The place chosen for the celebration of this edition was the MEEU (Madrid Exhibitions and Urban Events), a unique space with high vaulted ceilings located on the first floor of the Chamartín station. The conformation of the space, with the stands arranged to both of a ship, facilitated the assistants to know all the participating brands and, at the same time, to enjoy a pleasant atmosphere in the conference and networking areas. The showroom of hotel interior design products was attended by 50 companies that presented their novelties in all types of products and specialized solutions in contrac-hospitality: furniture, coatings, lighting, textile products, outdoor, bathroom, flooring and home automation. The 25 speakers who participated in the 8 sessions of conferences discussed the importance of hotel interior design under perspectives of strategy, marketing and space design. On Wednesday morning there was a discussion table with Iñigo Cumella, senior hotel broker at Christie & Co, Fernando Martínez from the Petit Palace hotel chain and Víctor Medina from Lemobba Architects & Designers, providing a 360 degree view of hotel repositioning in Spain through of the reconversion of singular buildings in hotels for the luxury segment. Next, Diego Gronda, important international designer and CEO at Gronda Studio, discussed the importance of interior design projects as a strategic tool to connect with the target audience, illustrating his presentation with the case studies of the VP Plaza España Design hotel and the Tatel restaurant Miami Next, a discussion table was held in which Lara Elbaz participated, Lighting Designer in the professional association of lighting designers, and Loli Moroño, CEO in Proxectos PF1. Both Wednesday and Thursday at noon, the InteriHotel organization offered a catering service to the attendees, whose environment fostered networking and the generation of contacts among the participants. On Wednesday afternoon, Beatriz Rubio, director of accessibility and coordination of the equality area of Ilunion Hotels, gave a presentation on good accessibility practices for the hotel environment. Next, Enrique Rovira-Beleta, director of the Architecture and Consulting Firm Rovira-Beleta Accesibilidad, who spoke about the architecture of the senses and the great challenge for hotels to improve accessibility, intervened. The session ended with a discussion table in which María García del Real, interior designer at IHP International Hotel Projects, participated. The first day conference program ended with the intervention of Francesc Rifé, interior designer, designer and founder of Francesc Rifé Studio, who presented how to transform the hotel into a 4 or 5 star Grand Luxury through an interior design project. The session ended with a discussion table with Gelo Álvarez, designer and co-founder of oopen studio and Miguel Ramírez, director of operations at Barceló Hotel Group. On Thursday, the first session of lectures was given by Christina Rebolo, architect and founder of the study Veintiochoymedio, who made a presentation on the microsegmentation for hotels and on how to design interiors using strategies of positioning and customer orientation through marketing and interior design . Next, a discussion table was held, which was joined by Gonzalo de la Mata, CEO at Sleep’n Atocha, and Juan Luis Medina, director of Madrid in Love. Next, Miguel Salom, director of The Hotel Factory, spoke about repositioning as a strategy for generating value for investors and hotel companies, providing a global vision of such a complex environment as the tourism industry is currently developing. After his presentation, a debate table was held with the participation of Mar Vera, interior designer and CEO of Enves Design and Welcome Design, and Mariano Martín, architect at Estudio Mariano. In the afternoon, José Manuel Fernández, architect and partner of the interior design studio Cuarto Interior, presented a case study on the integral design of the Room Mate Gorka Hotel in San Sebastián. The session ended with a table debate, con la participation of Cutu Mazuelos, co-founder of Stone Designs and Ramón Fernández, director of the technical department of Room Mate Hotels. The last presentation of the event was made by Eva Longoria, Studio Leader and Interior Designer at the Rockwell Group office in Madrid, who presented another case study, this time from the Gran Hotel Inglés in Madrid, focusing her speech on how to include the place in the narrative design. 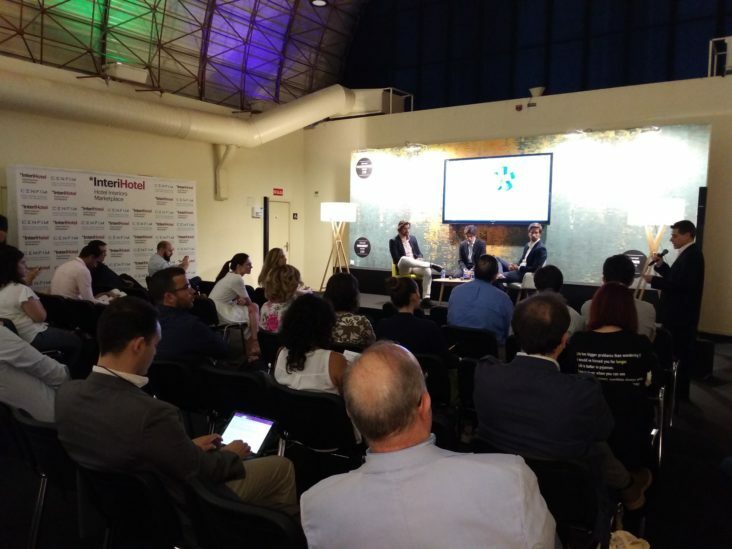 To close the conference program of this edition, a debate table was held with the intervention of Ignacio Jiménez, CEO and founder of Hidden Away Hotels, and Pedro Bernal, founding partner of the DBD consultancy. Taking advantage of the celebration of the event and the presence of brands and prescribers in the sector, CENFIM presented the SENTINEL project, co-financed by the European Commission, which will analyze emerging markets in contract-hospitality and help companies in the sector to internationalize in this market. The opening ceremony was held on Wednesday after the end of the conferences and was chaired by Mrs. Marta Blanco, Director General of Tourism of the Community of Madrid. The representatives of professional associations that have collaborated with the organization in InteriHotel Madrid participated in it: Mr. Carlos Lahoz, vice-dean of the Official College of Architects of Madrid (COAM), Mr. Gregorio Pozo, General Secretary of the Official School of Interior Designers and Designers of Madrid (CODDIM), and Ms. Soledad Hernández, President of the Designers Association of Madrid (DIMAD). The authorities and representatives of associations made some very positive reflections on the event and on the necessary contribution of professionals in hotel interior design in Spain. InteriHotel is an event organized by CENFIM and AMIC and has the support of the Ministry of Industry and Tourism and of ACCIO (company department of the Generalitat of Catalonia). The next edition of InteriHotel will take place from October 24th-26th, 2018 at the International Convention Center of Barcelona (CCIB). The event is a reference in southern Europe on hotel interior design and the most important in Spain in this sector. 180 brands will participate in the Barcelona 2018 edition, specializing in contract-hospitality and it is expected that 5,000 professionals – all from hotel companies, architects, interior designers, decorators and project management companies – will attend to find suppliers for hotel reform and/or construction projects (in the 2017 edition, 1,200 projects were present). InteriHotel Barcelona 2018 will present the latest trends in hotel interior design, in addition to holding an important summit with 45 speakers of international scope, participating in 14 sessions of conferences on topics relevant to the sector.